We&apos;re expecting Huawei to unveil the Mate 20 Pro at a special event on October 16, alongside the standard Mate 20 – part of a very busy October for smartphone launches we might add – and some New renders of the upcoming phone just hit the web. Picked up by SlashLeaks, the renders show the mate 20 Pro in a blue silicone case, as well as a "smart view" cover where part of the screen is left free to show an always-on display (with the time and date and other information). Around the back, we can see the rumored triple-lens rear camera in its rectangular configuration. The leaks would appear to confirm that the Mate 20 pro won&apos;t have the teardrop-style notch up at the top, like the Mate 20 is said to be carrying. Instead it goes for a more conventional display notch, possibly to hold some extra face-scanning technology. 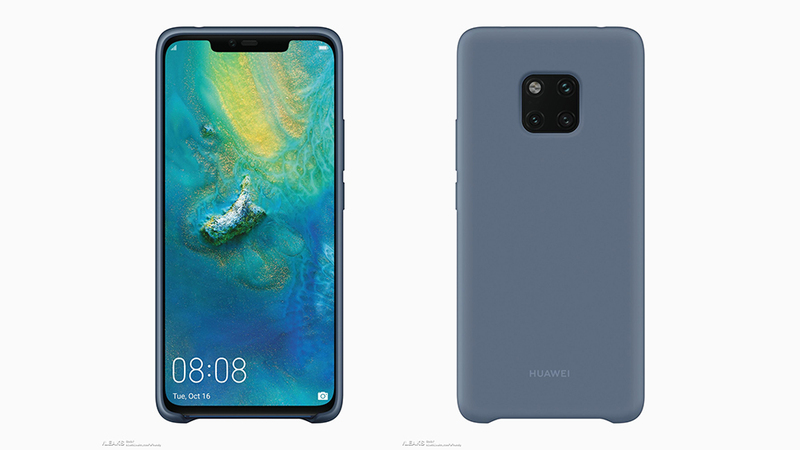 We&apos;ve already had one huawei Mate 20 device see the light of day, of course: the Huawei Mate 20 Lite. While this phone is likely to share several design cues with the handsets that are yet to come, the more expensive phones should come packing more of a punch. So far we&apos;ve heard that the Mate 20 and the Mate 20 Pro are going to come rocking in-screen fingerprint scanners on the front, and the new leaks (with no cut-out on the cases for a rear fingerprint scanner) would seem to confirm that. Wireless charging is apparently on the way too, based on accompanying renders of a charging dock. The same source has shared images of a new "NM card" as well, which is apparently Huawei&apos;s own take on the standard memory card format. If you want some expandable storage for your new Mate 20 Pro phone, then Huawei will sell it to you.